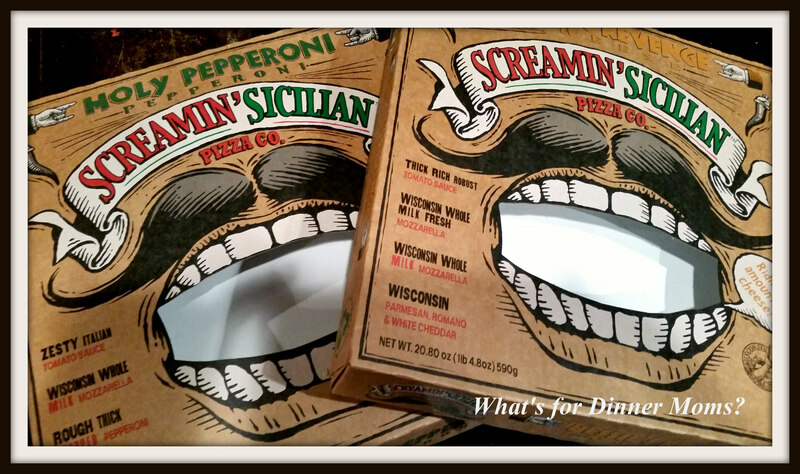 Screamin’ Sicilian Frozen Pizza – I am a Marketers Dream – What's for Dinner Moms? We were at the grocery store the other night to pick up a couple of fresh items to use in dinners over the next few days. It was getting kind of late and I needed to go home and make dinner. It was supposed to be potatoes and ham au gratin with broccoli and cauliflower substituted for half the potatoes. Not a difficult dinner to make but it does need to cook for about an hour. We passed an end cap highlighting a frozen pizza sale, buy one – get one free or 2/$7.00. The box was different and really stood out. I could see the actual pizza inside the box. Not just a picture of the “model pizza” used for advertising purposes. I glanced at pizzas and the cheese pizza really caught my eye. I did not add cheese to the above slice. It has huge thick rounds of mozzarella right on top! My kids saw me looking at the pizza and came over. They agreed they looked good and asked if we could try it for dinner tonight since they were hungry and it was getting late. Normally, I would probably say no but I was intrigued too. We chose a Holy Pepperoni and a Bessie’s Revenge Cheese Pizza. They had others too such as Boss Hog (sausage) and Spicy Clucker (jalapeno chicken bacon ranch sauce and cheese).But, we picked the two that everyone could agree on tonight. We all agreed the amount cheese on both pizzas was amazing. The pepperoni was tangy and delicious! We baked the pizza directly on the rack of the oven so the crust was nice and crispy. The toppings were so generous for a frozen pizza. We added nothing to each of these pizzas. I am always having to add cheese, pepperoni or something to frozen pizzas so it was nice to just open and bake it. We all agree we would buy these again. My son wants to try the Spicy Clucker and they have a Mambo Italiano that my daughter thought she wants to try. On their website they mention having Strombolis but I did not see those in our grocery store. I may have to ask next time I go to the store if they plan on stocking them so I can try those too! *I am not in any way affiliated with The Screamin’ Siciliam Pizza Co. I was not compensated in way for this post. I purchased the pizzas with my own money and all thoughts and opinions are my own and should be read as such. Friday’s at my home are homemade pizza and movie night! Woo-Hoo have a great weekend. Thank you! I normally do homemade pizza but this was so easy and I was lazy. LOL really for a frozen pie it isn’t bad Marci-you did good!!! I had never seen it before. Then I saw it was out of Madison, WI so I had to try it! I’ve never tried this particular brand, but I will say that although we eat very little processed food anymore, I can be swayed by a good-looking frozen pizza once in a while. Truthfully, though, we tend to go for the pre-made deli pizza’s if I’m in a pinch. I might have to see if they carry these in our local stores and give them a chance on my next “night off”. I totally agree. We do very few processed food meals but once in awhile…. I had to try it when I saw it. These are relatively new frozen pizzas, and when they first came out they were only $3.00 each. So, we grabbed a couple to try…and I agree! They are really good! I was surprised by the price and quality! Usually toppings are skimpy. My daughter looked at the rounds of cheese on top and immediately asked to try that one. We tried this for the first time a few weeks ago! We usually stick our basics (digorno and red baron when it’s on sale). Like you, I was drawn in by that box (such great marketing!). It was delicious and would definitely get again! For the price it was far better than the others. Have you tried any of the other flavors? I am wondering about the jalapeño bacon ranch one. I think my son will love it but not sure about the rest of us. I haven’t!! But I do plan on trying the other flavors! The jalapeno bacon ranch sounds like something I’d love – but I’m not sure about Tyler. I think it’d depend on whether or not it was actually spicy. Let me know if you guys try it out! I will! My son loves spice so he really wants to try it. I told him next time they go on sale I will pick a few up. I can eat up your whole blog if I’m honest. it’s so delicious!! 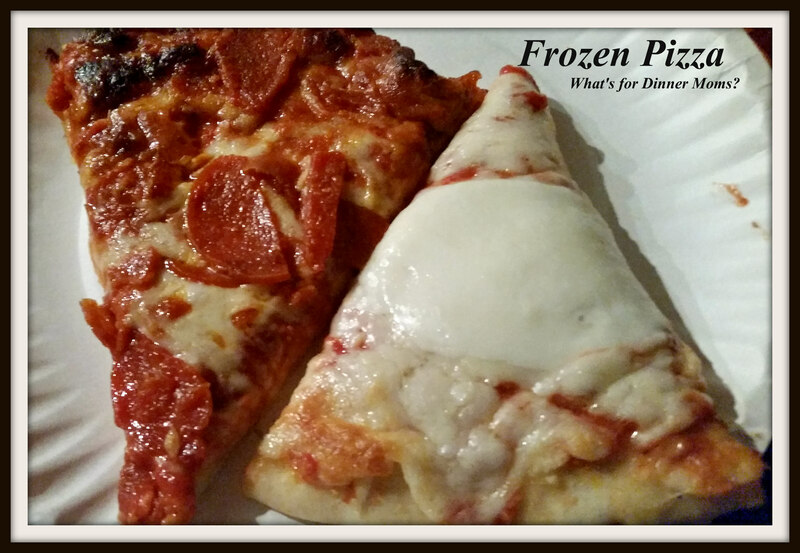 A frozen pizza isn’t so bad for someone who can’t cook like me xD thanks for sharing! Thank you! Frozen pizzas and other things are yummy! My secret favorite frozen food is Fridays Potato Skins. Dang that looks like great pizza for frozen!!! I LOVE that brand as well! It’s the only frozen pizza I like. We are hooked. Tried the sandwiches tecently too. Just as good for a fun lunch or dinner.